One of the biggest stories of the offseason (second only to the reason I started this blog) has been the complete retooling of the Eagles’ defensive line. But was the front four really the problem? Looking at PFF’s defensive stats from the last two years, we can see how effective various parts of the pass rush were from the late Jim Johnson in 2008 to McDermott in 2009. The chart below shows the change in percent of total rushes and negatve plays (Sacks, Hits, Pressues, Batted Passes) made by each unit. In case the chart isn’t completely intuitive, “DE % Rush” is the percent of total “Pass Rushes” by defensive ends (including the DEs that move inside on passing downs). 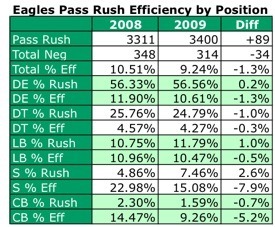 “DE % Eff” is just the negative plays caused by this group, divided by their number of rushes. Then there’s the year-over-year difference. 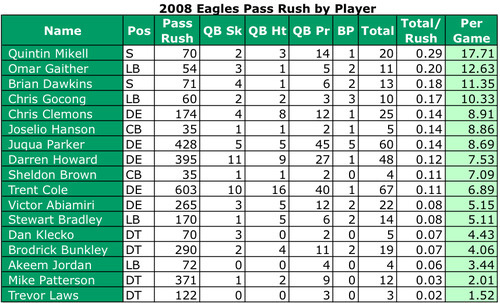 As we’ve talked about on multiple occasions, the pass rush from defensive tackles is basically non-existant. Although guys like Bunkley, Patterson, Laws, and Dixon were in the game on more than one quarter of pass plays, they caused negative plays for the offense less than five percent of the time. That’s the most obvious sign yet that the Eagles are getting no pressure from those big fellas. The linebackers, despite the drastic injuries, seem to have come out pretty much even on blitz pressure. The defensive backs definitely were less effective — but they account for only seven percent of all pass rushes. Still, perhaps because their blitzing was so infrequent, it was more effective than anything else. So that brings us back to the defensive ends, the guys who are being paid pretty much exclusively to get after the quarterback. How’d they do? Pretty much the same overall from 2008. There was a drop by a little more than a percentage point. This is a much bigger portion of the total rushes, so one percent means a lot more, but it still doesn’t tell me that the Eagles got significantly worse all of sudden along the front line. What if we compare by player? Here’s 2008 and 2009, for every player who rushed the passer at least 20 times (“Per Game” stats are based on ~62 offensive plays, all passes). 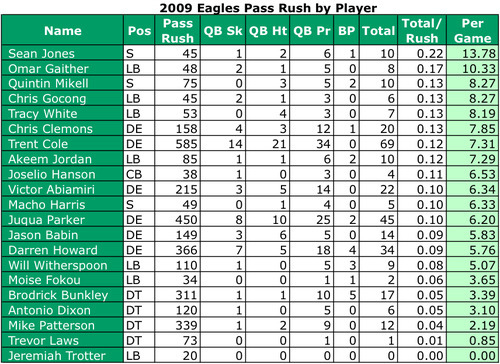 All of the defensive ends outside of Trent Cole and Victor Abiamiri declined from 2008 to 2009. And considering none are really up-and-coming youngsters, it probably was a good idea to bring in some fresh blood. Other interesting things: Sheldon Brown went from 35 blitzes under Jim Johnson to a mere five with McDermott. A healthy Joselio Hanson looks like his still and effective blitzer from the slot. Surprising no one, Asante Samuel has only blitzed six times in in the last two seasons. Omar Gaither is a really effective blitzer. Too bad his days in Philly seem numbered. And here’s yet more evidence that Chris Gocong probably should not have been stuck at SAM linebacker. Tagged with Antonio Dixon, Asante Samuel, Broderick Bunkley, Chris Clemons, Chris Gocong, Cornerbacks, Darren Howard, Defensive Ends, Defensive Line, Defensive Tackles, Efficiency, Jim Johnson, Joselio Hanson, Juqua Parker, Linebackers, Negative Plays, Negative Plays per Rush, Omar Gaither, Pass Rush, Pressure, Pro Football Focus, Sacks, Safeties, Sean McDermott, Sheldon Brown, Trent Cole, Trevor Laws, Victor Abiamiri. July 23, 2010 by Brian Solomon.